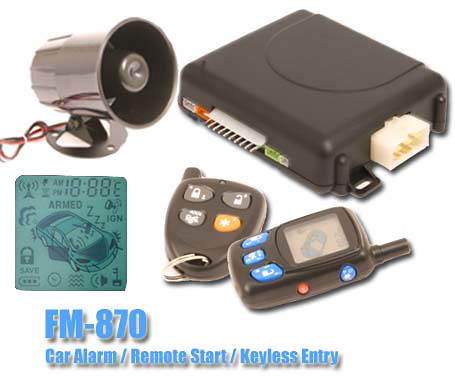 FM-870-T 2-Way Car Alarm, Remote Starter with LCD Pager Remote & 5 Button Remote with 6 Auxillary Outputs. Includes Temperature Sensor. A small and innovative Remote Transmitter Pager with Alarm and Remote Starter. The FM-870 will instantly alert you should your vehicle be violated. Remote Start and Monitor your Vehicle from 2500+ ft away. The bright LCD display on the Transmitter accurately monitors doors open/closed, alarm armed or disarmed, hood and trunk open/closed, and hard impacts to your vehicle. It even advises whether the vehicle's engine is running. • One 5 Button LCD Transmitter Pager with High Tech Back Lit Display. • Six Remote Auxiliary Channels For Trunk Release, Power Window Control, Etc. • Instantly alert should your parked vehicle be violated. This item is currently unavailiable for purchase. When purchasing the FM-870-T 2-Way Car Alarm, Remote Starter, LCD Pager w/Temp Sensor, consider the other items listed below. You can add all desired items from below at one time by clicking the Suggested Items Add Page link.